This book is intended for BI, DWH, ETL developers, BI/DWH/Analytics managers, analysts, and business users who already have MicroStrategy in their organization and want to take it to the next level in order to increase performance and improve user experience. In addition, it helps the reader to migrate from MicroStrategy 9 to MicroStrategy 10 and to start using the new capabilities. Business intelligence is becoming more important by the day, with cloud offerings and mobile devices gaining wider acceptance and achieving better market penetration. MicroStrategy Reporting Suite is an absolute leader in the BI market and offers rich capabilities from basic data visualizations to predictive analytics. It lets you various delivery methods such as the Web, desktops, and mobiles. Using real-world BI scenarios, this book helps you to implement Business Analytics solutions in big e-commerce companies. It kicks off with MicroStrategy 10 features and then covers schema design models and techniques. Building upon your existing knowledge, the book will teach you advanced techniques for building documents and dashboards. It further teaches various graphical techniques for presenting data for analysis using maps, graphs, and advanced charts. 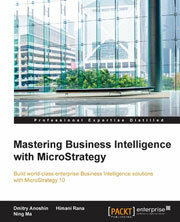 Although MicroStrategy has rich functionality, the book will show how to customize it in order to meet your business requirements. You will also become familiar with the native analytical functions that will help you to maximize the impact of BI solutions with powerful predictive analytics. Furthermore, the book will focus on MicroStrategy Mobile Analytics along with data discovery and desktop capabilities such as connecting various data sources and building interactive dashboards. The book will also uncover best practices, troubleshooting techniques for MicroStrategy system administration, and also security and authentication techniques. Lastly, you will learn to use Hadoop for MicroStrategy reporting. By the end of the book, you will become proficient in evaluating any BI software in order to choose the best one that meets all business requirements. This book will be focusing on providing extensive guide to plan how to design and develop complex BI architecture for real world scenario, using Microstrategy 10, best practices and collected experience working with BI, predictive analytics, and Microstrategy and big data.